This book outlines the background and overall vision for the Internet of Things (IoT) and Machine-to-Machine (M2M) communications and services, including major standards. Key technologies are described, and include everything from physical instrumentation of devices to the cloud infrastructures used to collect data. Also included is how to derive information and knowledge, and how to integrate it into enterprise processes, as well as system architectures and regulatory requirements. Real-world service use case studies provide the hands-on knowledge needed to successfully develop and implement M2M and IoT technologies sustainably and profitably. Finally, the future vision for M2M technologies is described, including prospective changes in relevant standards. 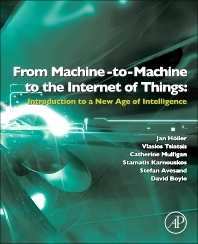 This book is written by experts in the technology and business aspects of Machine-to-Machine and Internet of Things, and who have experience in implementing solutions. Jan Höller is a Research Fellow at Ericsson Research, where he has a responsibility to define and drive technology and research strategies and to contribute to the corporate strategies for the IoT. He established Ericsson’s research activities in IoT over a decade ago, and he has been contributing to several European Union research projects including SENSEI, IoT-i, and Citypulse. Jan has held various positions in Strategic Product Management and Technology Management and has, since he joined Ericsson Research in 1999, led different research activities and research groups. He has served on the Board of Directors at the IPSO Alliance, the first IoT alliance formed back in 2008. He currently serves on the Board of Directors of OMA SpecWorks and is a cochair of the Networking Task Group in the Industrial Internet Consortium. Vlasios Tsiatsis is a Senior Researcher at Ericsson Research, Ericsson AB and has been working on the Internet of Things (IoT) for 20 years, on subjects ranging from energy-efficient communication algorithms on 8-bit microcontrollers to streaming data analytics in the cloud and recently to IoT Security.He has contributed to several research projects on Wireless Sensor Networks by DARPA, United States, European Union research projects such as RUNES, SENSEI, IoT-i, and CityPulse as well as internal Ericsson corporate research projects around machine/man/mobile-to-machine and IoT services. Vlasios has extensive theoretical and practical experience on IoT technologies and deployments and his research interests include security, system architecture, IoT system management, machine intelligence, and analytics. He holds a PhD in the area of Networked Embedded Systems from the University of California, Los Angeles. Dr Cathy Mulligan is a Visiting Researcher at Imperial College and was a founding Co-Director of the ICL Centre for Cryptocurrency Research and Engineering. She is also a Senior Research Associate at University College where she is Chief Technology Officer of the GovTech Lab and DataNet, which focuses on the potential and application of blockchain, AI and advanced communications technologies as a foundational part of the world’s economy. Cathy is an expert and fellow of the World Economic Forum’s Blockchain council and has recently become a member of the United Nations Secretary General’s High Level Panel on Digital Co-Operation. She holds a PhD and MPhil from the University of Cambridge and is the author of several books on telecommunications including EPC and IoT. Stamatis Karnouskos is an expert on the IoT at SAP, Germany. He investigates the added value and impact of emerging technologies in enterprise systems. For over 20 years, he has led efforts in several European Commission and industry-funded projects relate to IoT, Cyber-Physical Systems, Industrie 4.0, manufacturing, smart grids, smart cities, security, and mobility. Stamatis has extensive experience in research and technology management within the industry as well as the European Commission and several national research funding bodies (e.g., in Germany, France, Switzerland, Denmark, Czech Republic, and Greece). He has served on the technical advisory board of the Internet Protocol for Smart Objects (IPSO) Alliance and the Permanent Stakeholder Group of the European Network and nformation Security Agency (ENISA). Stefan Avesand is a Senior Software Researcher at Ericsson AB where he drives research within the domain of Artificial Intelligence, and how to apply this in network operations and smart devices (such as in predictive maintenance and the Ericsson Social Web of Things concept). Stefan has 15 years of experience from the field of telecommunications, both from a research and a product development perspective, as well as from an operator and a manufacturer perspective. He has been active in the Internet of Things area for several years and was recently managing the development of an operator based Smart Home solution at Ericsson Research, where he coordinated with Strategic Product Management and external partners to provide services such as TV, multimedia, energy management and home security.